While we had plenty of rain this year for my vegetables it was a poor year for fruit. We got so much rain this year that the peaches all aborted and the limbs oozed sap trying to find a way to compensate for the deluge. My persimmon also dropped most of its fruit in response to the excess rain. The only fruit that survived this year was a large Breba crop of figs and first year canes with sour blackberries. Most people with figs toss the Breba (or summer) crop. The fruit is generally not as good as main crop figs, and although I could have tossed it all in the compost pile, I thought I’d find something more immediately useful for them. That’s when I came across a recipe for something called a Shrub. 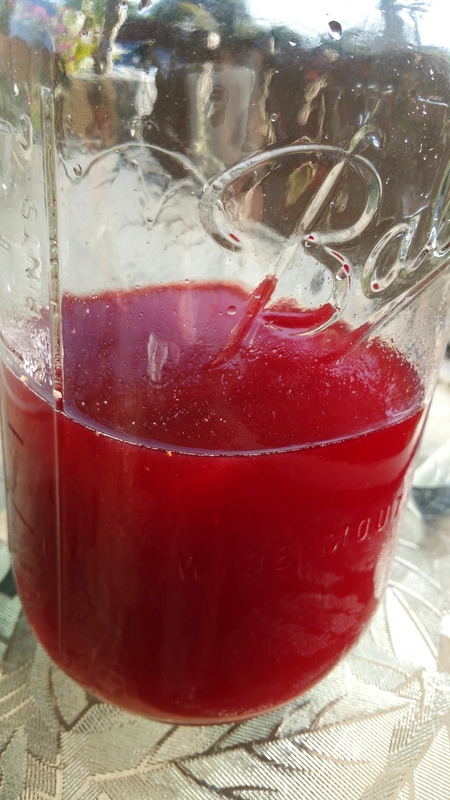 I am a recent convert for homemade fermented prebiotic foods. I’ve been making an awesome salsa the last couple of years and I can’t tell you how delicious a home ferment can be! It’s one of those things that once you try it: you jump in with both feet! Fermentation is one of those old time skills (like home canning) that make you nervous the first few times you do it. Mysterious and a little dangerous, your first foray into fermentation can make you wonder how anything that sits out on the counter for a week can possibly be healthy or taste good. All I can say is: give it a try. If you follow proven ferment recipes, I promise you won’t get sick and you will love the end result! I saw a drinking vinegar (aka shrub) for sale in a catalog and thought: I bet I could make this! Which after some research, I found that: yes, these are great homemade! There are a variety of shrub recipes out there. Some require cooking, I prefer my fruit (and veggies, like the salsa ferment I make) fresh. There were plenty of recipes to choose from. 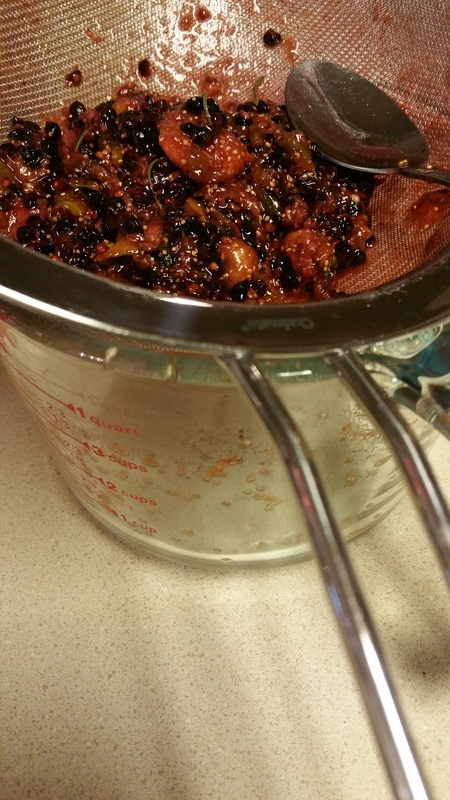 For my shrub I chose to make my own recipe after examining a few shrub recipes online. 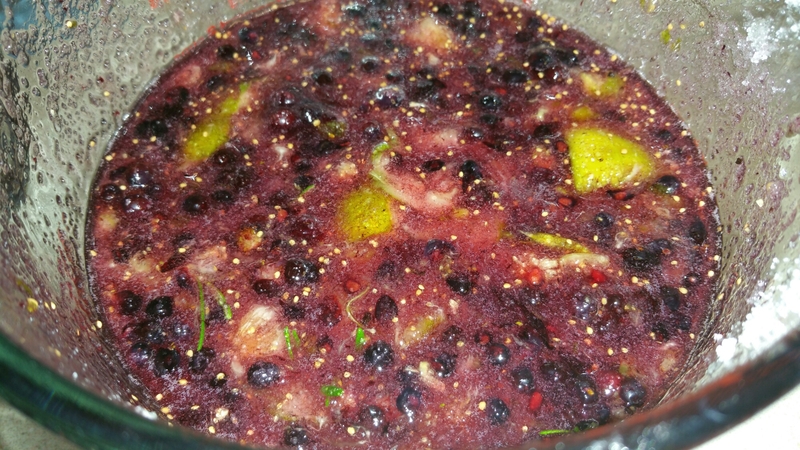 I mixed some flavors from what I had on hand: figs, blackberries, cracked black peppercorns and some home grown rosemary. I decided on using apple cider vinegar for the vinegar because I tried a spoonful with the fruit I had macerated, and I thought it was good with the apple cider. (Champagne vinegar would also be nice.) I tried a good quality balsamic vinegar with the macerated fruit and that was a definite “No”. To me the balsamic vinegar puts a “rotten fruit” taste in it that I couldn’t handle. 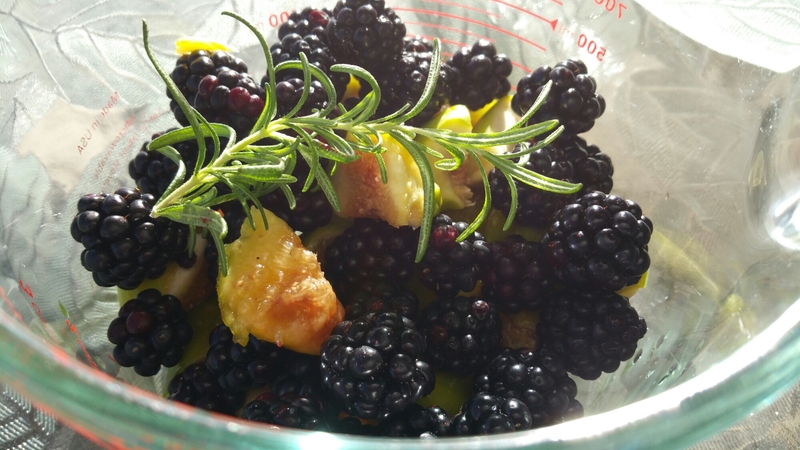 When you are making a homemade drinking vinegar (or shrub) you want half of your fruit to be very sweet: my Breba crop of figs, and half to be something tart: the blackberries (tart cherries would work too.) Luckily blackberries are usually for sale at the grocery (fresh or frozen) and the ones from the store are always tart. 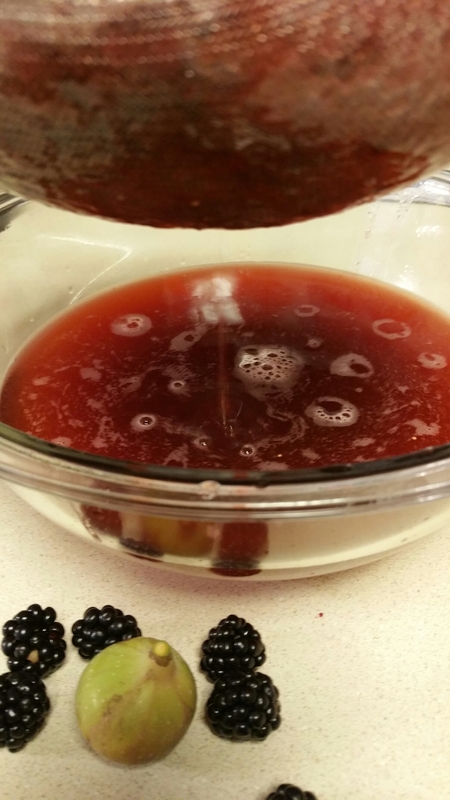 You could also add a little lime or lemon if you don’t want to go the blackberry/cherry route. For something sweet (other than figs) I would think blueberries, plums, persimmons, grapes or peaches would work well. You are going to be adding quite a bit of sugar, so having something tart makes for a kind of depth of flavor that I really enjoy. Taste it once you add the sugar and macerate the fruit. That’s when to add other flavors or adjust the fruit ratio until you are happy with the flavor. It will only become a deeper more complex version of the fruit and sugar combination from there. Mix the sugar in with the fruit until the fruit is coated. Add the fresh cracked pepper. Remove the stem and add the fresh rosemary leaves. 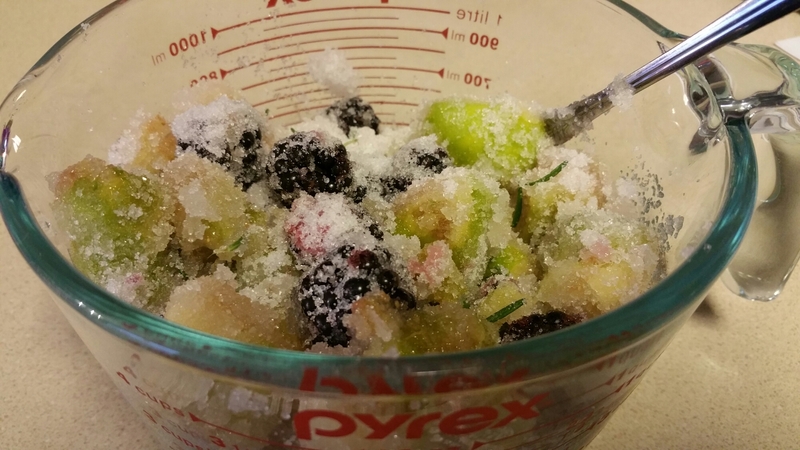 Mash the fruit mixture. (I used the pestle, from a mortar and pestle set, in a bowl but you can just use a fork or even a food processor.) Cover the fruit mixture with plastic wrap or a towel (to keep anything from getting into it) and leave it out out on the counter for 48 hours. 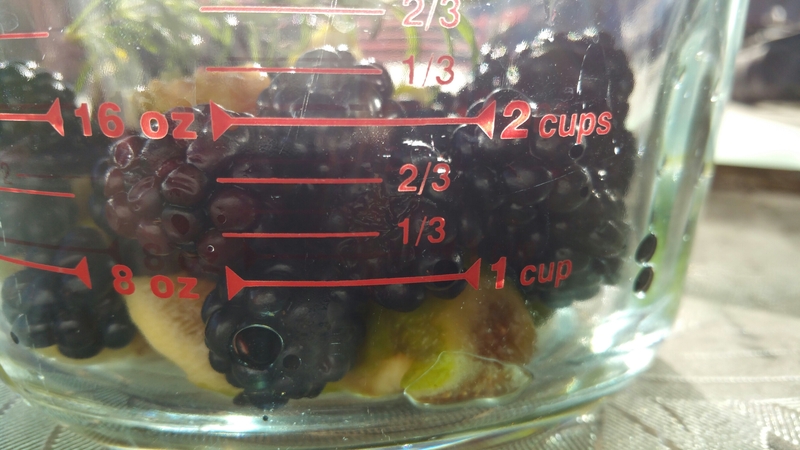 After the first 24 hours: stir and crush the fruit again, then let it sit again until the 48 hours has expired. Add the vinegar and strain the juice through a sieve into a large mason jar. Put the mixture on the counter (or in the fridge. Your choice. Refrigeration will slow down but not stop the fermentation. If you leave it on the counter a “wine” type flavor may develop. I aged mine in the fridge because I like a fresh fruit flavor instead.) in a sealed mason jar for at least a week. Open the jar daily to let gases escape and shake or stir the mixture daily. 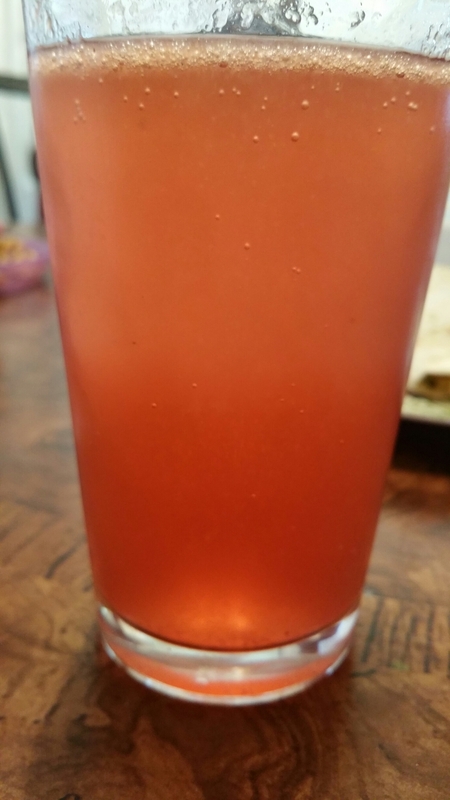 At the end of a week: add some carbonated water to a drinking glass (I use a lime flavored club soda.) 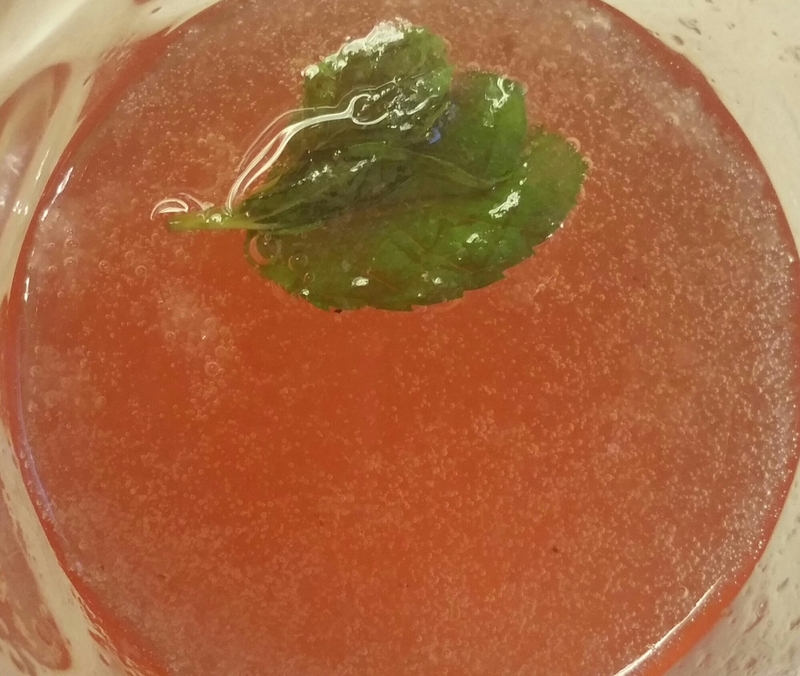 Fill the glass 2/3 of the way with the carbonated water: slowly add the shrub until you are happy with the flavor. You should taste the tartness of the vinegar but: it shouldn’t be overwhelming. Shrubs remind me of Italian sodas and I can definitely see where our modern day carbonated sodas get their flavors. The shrubs are a wonderful old time way to extend your enjoyment of fruit season and a great way to use up fruit that you would usually have taken from a plant and directly dumped it into the compost (overly ripe or damaged fruit is fine, but if it’s truly rotting find something else to use!) You can also use up the tail end of any fruit glut in a Shrub. My children enjoy the shrub as well. It is a healthier alternative to pop. I like a sprig of mint in mine. Just roll the mint between your fingers and crush it a bit before you put it in. Vodka would also pair with this well! Same for us on the abundance of water. And that was after a very bad winter and a really late frost. Zapped all of my cherries and pears. We had basically no blackberries this year. For a stellar year of moisture, it’s been horrible for fruit. I’ve never heard of a shrub. Might have to give it a try. I am a fan of vinegar, so it should be good! I totally agree! It’s either drought or floods the last few years. Thanks for stopping by! I appreciate the visit. hi I am following your blog, very informative and different. must try this recipe, very unusual! kind regards. I’m glad you are enjoying my posts! Thank you for coming by and commenting. I appreciate the visit! Thanks for sharing this great idea! I can’t wait to give it a try.